The Urban Land Institute ("ULI") recently published "Higher-Density Development: Myth and Fact", in order to dispel the many myths surrounding higher-density development and to create a new understanding of density that goes beyond simplistic negative connotations that overestimate its impact and underestimate its value. Elected officials, concerned citizens, and community leaders can use this publication to support well-designed and well-planned density that creates great places and great communities that people love. With the anticipated population growth and continuing demographic and lifestyle changes, consensus is building that creating communities with a mix of densities, housing types, and uses will be both necessary and desirable. "Higher-Density Development: Myth and Fact" is the sixth in a series of Urban Land Institute myth and fact booklets. The series is intended to clarify misconceptions surrounding growth and development. Other topics covered have included transportation, smart growth, urban infill housing, environment and development, and mixed-income housing. Higher-Density Development: Myth and Fact examines widespread misconceptions related to higher-density development and seeks to dispel them with relevant facts and information. Although the benefits of higher-density development are often understated, so are the detrimental effects of low-density development. The advantages and drawbacks of higher-density development are compared throughout this publication with the alternative of low-density development. In the process, misconceptions regarding low-density development are also addressed. Higher-Density development overburdens public schools and other public services and requires more infrastructure support systems. The nature of who lives in higher-density housing --fewer families with children -- puts less demand on schools and other public services than low-density housing. Moreover, the compact nature of higher-density development requires less extensive infrastructure to support it. Higher-density developments lower property values in surrounding areas. No discernible difference exists in the appreciation rate of properties located near higher-density development and those that are not. Some research even shows that higher-density development can increase property values. 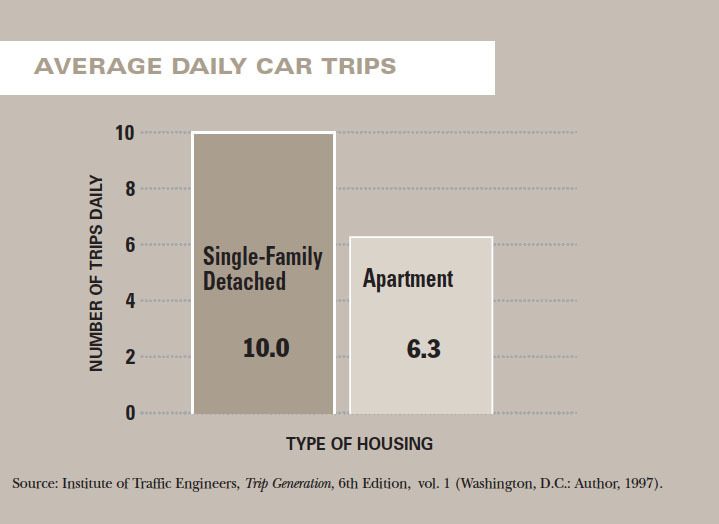 Higher-Density development creates more regional traffic congestion and parking problems than low-density development. Higher-density development generates less traffic than low-density development per unit; it makes walking and public transit more feasible and create opportunities for shared parking. Higher-density development leads to higher crime rates. The crime rates at higher-density developments are not significantly different from those at lower-density developments. Higher-density development is environmentally more destructive than lower-density development. Low-density development increases air and water pollution and destroys natural areas by paving and urbanizing greater swaths of land. Higher-density development is unattractive and does not fit in a low-density community. Attractive, well-designed, and well-maintained higher-density development attracts good residents and tenants and fits into existing communities. No one in suburban areas want higher-density development. Our population is changing and becoming increasingly diverse. Many of these households now prefer higher-density housing, even in suburban locations. Higher-density development is only for lower-income households. People of all income groups choose higher-density housing.